>Previously unknown photograph of Joshua L. Chamberlain? The other day, I got my emails from eBay with new items in the categories that I regularly watch. I looked through the new listings in antique clothing and then I moved on to the new listings in the “Joshua Chamberlain” search. This bearded fellow on the left caught my eye and the listing theorized that he was Joshua Lawrence Chamberlain but there was no proof. I consider myself to be an expert on the Chamberlains, even outside of my past life as Lawrence’s wife, so my immediate reaction was to think the seller was trying to scam unsuspecting Chamberlain-lovers. I don’t tolerate scams. I clicked on the auction with every intention of proving that this bearded fellow was not my former husband because between the Pejepscot Historical Society, Bowdoin College and a handful of other sources, I assumed that we already have every known photograph of this man. My initial reaction was no, this was not him. As I was about to click away from the auction, something about the eyes drew me back in for a closer look. Then, something about his unique heart-shaped mouth made me wonder, “Could this be possible?” In the interest of full honesty, I started feeling physically sick to my stomach, my forehead became damp with a cold sweat, and my hands began to shake. I prefer to stay on the logical side, though, so an emotional reaction to an image is not enough for me. I need more concrete proof. I lifted the picture from the eBay page and fed it to my graphics program. Then I went into my stockpile of known photographs of Lawrence and began painstakingly comparing feature by feature. This was my first comparison. These images are at different angles and are three years, two promotions and one near-fatal wound apart. I noticed that the noses are rather similar but the differences in angles and differences in facial hair were throwing me off and I was not yet willing to say that the bearded fellow was or was not Lawrence. I knew I had seen him photographed at that angle before, though, so I searched through my computer files again and came across a photograph taken at the end of the war by Matthew Brady. I cut out the face in the Brady image and resized it to be compared to the face in the bearded picture. The result was more convincing than I expected. Again, the shape of the nose appeared almost identical between photographs. With the Brady image, however, there is a striking resemblance between the two sets of eyes. In the Brady image, Lawrence is looking upward, while in the bearded image, the man is looking straight ahead, but that does not diminish the fact that the eye color is the same shade and the general shape of the eyes and the way the eyebrows fall are the same. If you look at the cheekbones next, they appear to be the same shape and the texture of the skin, although difficult to see in old images, is strikingly similar. The last thing I noticed was the line of his mustache. It starts at the nose in both images, drops down a bit, and goes outward over the upper lip. I remembered that when I watched the show in which they did facial recognition in the case of Jeffrey Keene and John Brown Gordon, they overlapped the images to see how they matched. I decided to try it in this case even though the images are slightly different in angle and age. What I found shocked even me. Everything matched. Granted, all human faces look alike to a degree, but the profile matching at such an exact way is pretty convincing in itself. Matching up facial features is never enough though. There should be historical documentation in order to back up the theory that this bearded man is indeed Joshua L. Chamberlain. It occurred to me that I had read in one of Lawrence’s biographies that he had entered the war with a beard as opposed to the infamous drooping mustache that we all know and love. I don’t remember if it was in Fanny & Joshua or In the Hands of Providence but I seem to remember reading a quote from one of his letters not long after he entered active duty in which he described how he had changed his facial hair. I need to find this quote but my life is still in disarray from the Atlanta flooding and my books are still in storage. The bearded man is ranked at lieutenant colonel from what I can see. Lawrence was commissioned by Governor Washburn in 1862 as lieutenant colonel of the 20th Maine under Colonel Adelbert Ames. 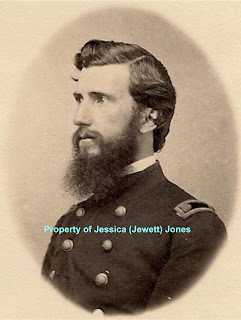 He was not promoted to colonel until just before Gettysburg when Ames left the 20th for his own promotion. 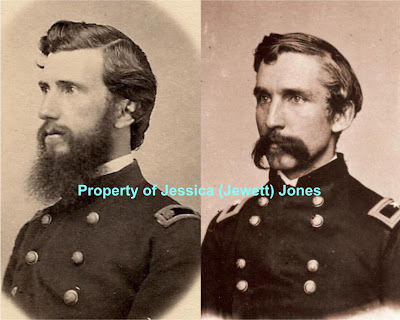 So if we have documentation that Lieutenant Colonel Chamberlain was bearded at the beginning of his service in the war effort, the bearded man is a lieutenant colonel, and the photographs are nearly identical in comparison, then that is quite a lot of evidence to support the theory that this man is in fact Joshua Lawrence Chamberlain. Of course I can’t tell if this photograph is totally unknown either. There is no marking on the back, which tells me that it is probably a copy of the original CDV (photograph on a cardboard card). I do know that this photograph is unknown to me. I have had the pleasure of going through Chamberlain files at the Pejepscot Historical Society, Bowdoin College and the Maine Historical Society. I have never seen this image in any file, display or reprinted in any book. I’m fairly certain I stumbled onto something the “experts” have not seen yet. The auction was pulled down by eBay because the seller could not prove the photograph was actually Lawrence, so I wrote to the seller privately and we struck a deal. I paid for it and it’s on its way to my house as I write this, supposing it was mailed today as the seller said it would be. You never know how life might delay something. At any rate, this photograph is now mine, as in I better not see anybody using it without my permission. There is no way to prove without absolute certainty that this bearded man is Lawrence but the evidence I have amassed shows a strong case for proving that it is him. 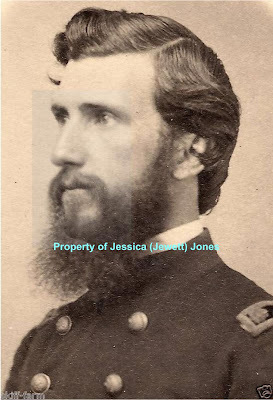 I believe my photograph pre-dates all known war portraits of Lawrence because of the rank and beard, which I suppose is historically significant. I didn’t want it for history. I wanted it because it was probably my only chance to own a photograph of a man who was once my husband. I won’t stop holding my breath until the package comes in the mail but I have paid for it and the deal was struck, so I consider the image mine at this point. 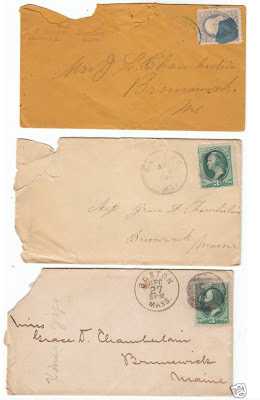 As an aside, I also got three more Chamberlain family letter covers. They go for pretty cheap, so I try to rescue as many as I can. I think I’m up to about 17 letter covers or so, some that I have traced in origins and that have told me new and interesting things that books have not. I have a new mystery to trace with the first letter cover in these three, from E. F. Brown Jeweler in Brunswick, Maine, to Mrs. J. L. Chamberlain. Here are the newest letter covers in my collection. As another aside, a different image of Lawrence turned up on eBay as well. It was part of an album and his autograph was on the opposite page from the photograph. I don’t think I have seen this angle before but I’m fairly certain this is an image from a known sitting done around 1873, after he was Governor of Maine. I didn’t try to win this auction, though. I don’t stand a chance of winning his auctions when his autograph is involved because it’s worth so much money. 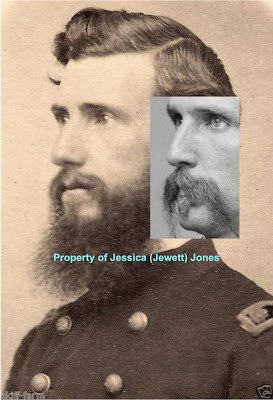 >I agree with you Jess, I truly believe it is a picture of Mr. Joshua Lawrence Chamberlain. The thing you did with the overlay sold me on that fact. I hope it comes in soon for you. >Pam, I found your post after a Google search and enjoyed examining the images. One thing about human heds that is helpful in these studies is that the shape of the ear is as unique to each of us as our fingerprints. Thus, a really good way to compare these is by looking at the ridges within the ear of your subject and a known photo of JLC. If you like I can send a comparison photo of the two I just did for you to look at. I was bought a painting today at an estate auction that contained many Civil War pictures and paintings. 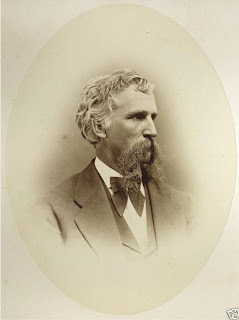 I am trying to determine if this is Joshua Chamberlain or somebody significant during this time period. Could I send you a photo of the painting?